Wedding harpist Tuscany Florence. An Italian high level professional wedding harpist in Florence available for wedding ceremony and aperitifs in Tuscany and in all Italy. She usually play in ceremonies and aperitifs during international weddings in Tuscany. She has a beautiful and extensive repertoire and she can also play music of your choice. So just send her some request and she will learn and play the songs you need for your event. Also available together with other musicians. Duo Harp and Violin, harp and voice, harp and oboe and other musicians ensemble. The sweet sound of the harp played from a talented and well known musician will accompany the most important day of your life. From classical repertory to modern pop songs. From Celtic popular music to famous melodies transcriptions. Wedding harpist Tuscany Florence is available in Tuscany and all over Italy. Below some video samples with harp solo, harp and violin. 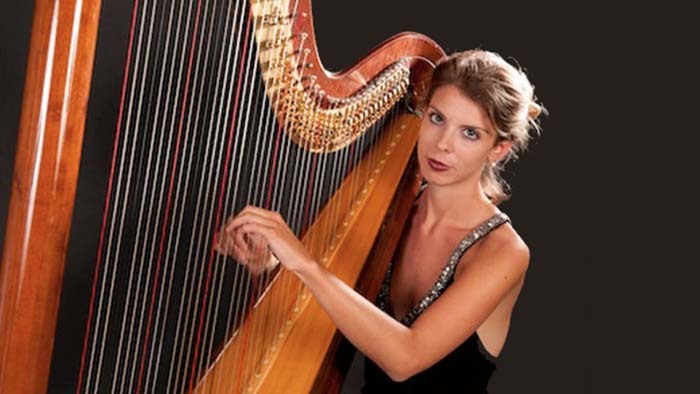 “Harpist Florence” is a professional high-level harpist with a remarkable stage presence based in Florence, Tuscany. The musician divides her time between her commitments to various important Italian symphonic orchestras and the musical entertainment of wedding receptions. Wedding ceremony, wedding aperitifs, wedding dinner. Harpist Florence is available to play in any event, for Church weddings, Municipality weddings or outdoor weddings. With her harp she can perform at religious ceremonies, civil ceremonies and blessings. She also performs during cocktail receptions, wedding dinners and any other type of event that requires a musical background with the unique sound of the harp. As many spouses and their guests were able to see for themselves the performance of this harpist is always a great success. Indeed harpist Florence, with her magic touch, her undisputed talent and her remarkable musical taste, has already given great happiness to an innumerable number of couples who got married in Tuscany! Harpist Florence collaborates with orchestras such as the Teatro and della Filarmonica alla Scala, the Maggio Musicale Fiorentino, the Rai National Symphony Orchestra, the Teatro dell’Opera di Roma, the Teatro Lirico of Cagliari playing with conductors such as R. Muti, C Abbado, Z. Metha, D. Barenboim, J. Conlon, D. Oren, V. Fedoseyev, J. Valcuha, P. Steinberg, C. Dutoit, W. Marshall, J. Kovachev and other. She has also perfomed for the Orchestra della Fenice in Venice, for the Arena di Verona and for the Teatro Massimo in Palermo. In addition to orchestral activity, she also works intensely in solo and chamber music in Italy and abroad. Her repertoire is constantly evolving. Harpist Florence gladly accepts requests of any kind from the newlyweds.